May 20, 2018. Real Sociedad visits the Camp Nou in the last game of the season. While Barcelona celebrates a new LaLiga title and honors their home grown legend, Andrés Iniesta, Real Sociedad faces the tunnel with the heads down. It’s the end of an era. The 3 year spell of Eusebio Sacristán finishes here. Eusebio took the team to fight for European spots in his debut season, to reach the so wished Europa League spot in the 2016-17 season. The team, without great economic tools (9th economic power in LaLiga), Eusebio built a team recognizable by their good football. 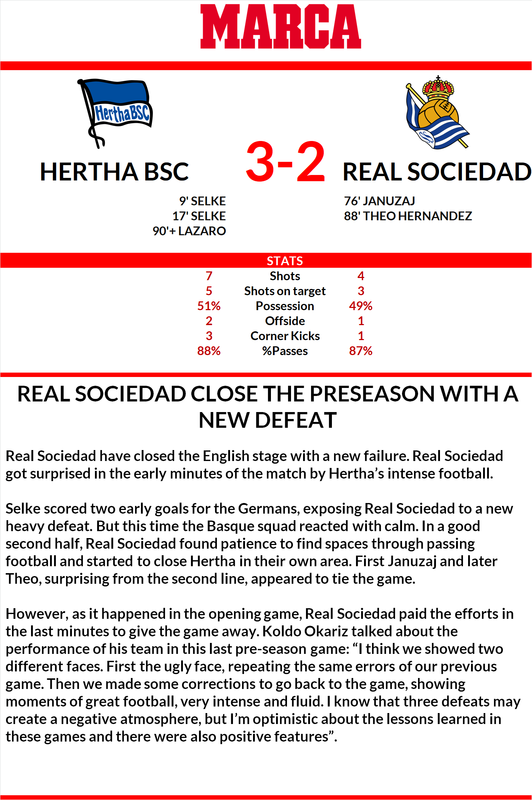 However, Real Sociedad has closed the 2017-2018 season 12th in LaLiga, out of the UEFA Europa League at the Round of 32, eliminated by RB Salzburg, and out of the Copa del Rey at the Round of 16, knocked out by UE Lleida, a Segunda B team (3rd tier in Spanish football). If the results were far from the expected, other aspects have a negative impact on the club. In January 2018, after Manchester City splashed 65 million euros to Athletic to sign Aymeric Laporte, ‘Los Leones’ target San Sebastián and surprisingly pay the release clause of Íñigo Martínez, Real Sociedad’s home-grown central back, and re-open wounds in an eternal rivalry. The atmosphere gets darker with the departure of Xabi Prieto, the legendary captain of the team, a one-club man, who announces that he retires in tears. 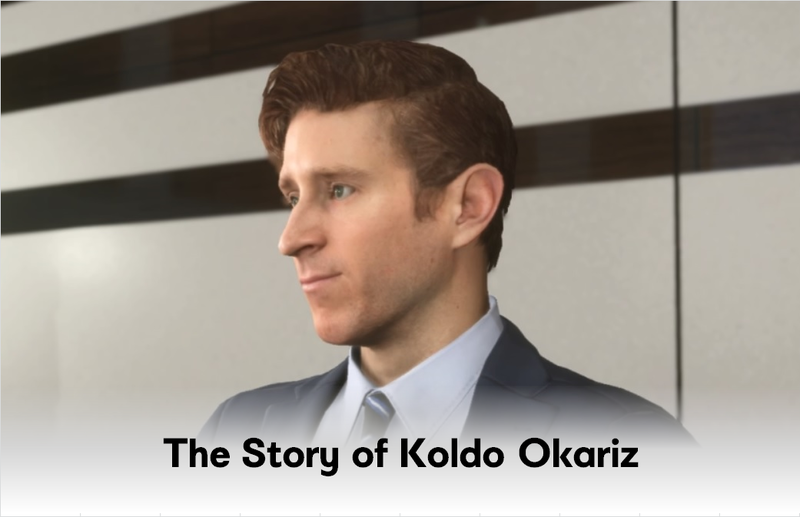 The club, presided by Jokin Aperrbay, fires the manager and announces the signing of Koldo Okariz (fiction character), a 40 year old manager, who started his career at the academy of the club and completed his formation as assistant manager of Jordi Gilabert at Villarreal and Inter. 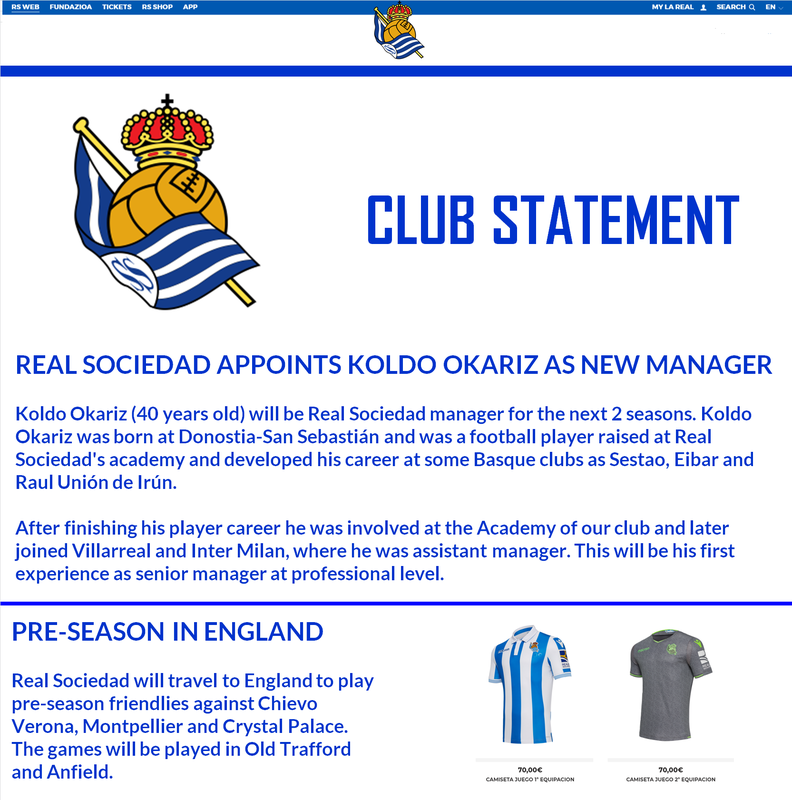 This is not a story about Real Sociedad, but the story of Koldo Okariz. There’s no initial idea of where the story can go. It will depend on the results of the manager, his own decisions… but also yours, as I hope to introduce ideas to make the usual readers to get involved in the story, just as I did last year. I'll tell you more about it soon. I also hope to be able to make it as realistic as possible, introducing some self-restrictions that I will also announce. Welcome to this story and I hope you have fun with it. Have always been a big fan of your stories. A story about the manager instead of the team is always exciting because the story can make a sudden turnaround due to unexpected happenings. 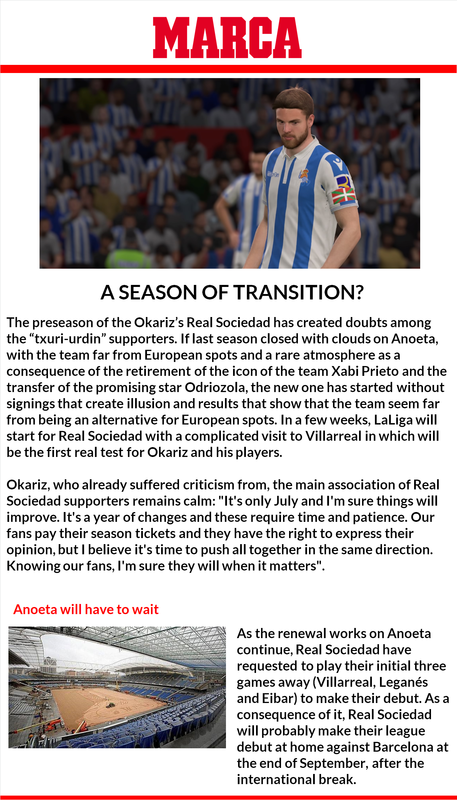 I'm not really familiar with Real Sociedad so I'm looking forward to it even more! First transfer window is disabled. [*]The design of the team will follow the league rules: Only 25 players in the first team and, among them, only 3 non-EU players. The squad numbers go from 1 to 25. 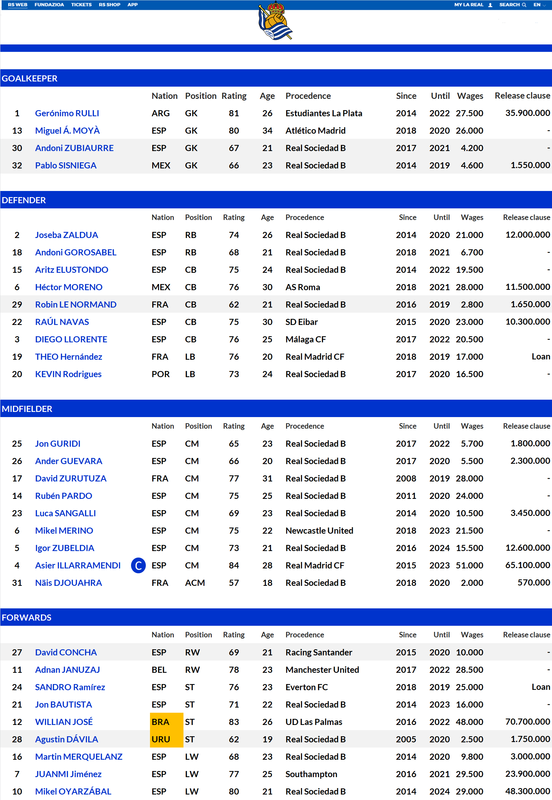 The team is also allowed to have B-team liscences (#26 onwards), but they have to be U-23. [*]Cannot hoard high-potential (potential>team rating and <=21 years old) youth players from any of the top clubs (teams from the top-4 leagues -Spain, England, Germany and Italy- and clubs from other leagues who are competing in the UCL and have a higher team rating). Maximum one "good" pre-contract signing per year, meaning that the player will either be a starter or frequent substitute (main squad). One more pre-contract signing is allowed only if he is a reserve or infrequent substitute. [*] Summer window: Maximum 2 signings to your starting 11. Two more signings are allowed to improve the bench (in total 4 signings). Selling two players from your main 18 gives you one additional signing to replace these (to encourage use of existing reserves and youngsters). It's possible to make an additional 2 signings to your reserves. [*] January window: Maximum one signing to your starting 11, and one to your bench. Same exception as during the summer window. Pre-contracts do not count towards these. Signing one reserve is allowed. [*] You must make a 140% starting offer if a transfer target is above the team rating. 130% if same rating. Minimum 110% if below but within 5 points. Outside of that, anything goes. [*] Major exception: Players that are 28 years or older can be signed for whatever price you can manage. Transfer limits above still apply (adjust however you see fit). [*] You cannot approach players that are more than 3 points higher in overall than your team rating, and sign maximum 1 such player. No other transfers can be made more than one point above team rating. You cannot buy players from top clubs (teams from the top-4 leagues -Spain, England, Germany and Italy- and clubs from other leagues who are competing in the UCL and have a higher team rating), if they have no reason to leave. E.g. if they are regular starters, very happy, just arrived etc. Reserves must be sold if the offer is larger than or equal to 120% of the player's value, unless recently signed or deemed a crucial part of the team's future talent (must be younger than 21 and have a potential >=the team's rating). [*] Bench players must be sold if the offer is larger than or equal to 140% of the player's value. Same exceptions as above, except that they can now be up to 23 for you to reject the offer. [*]Starters must be sold if the offer is larger than or equal to 150% of the player's value, unless they are 2 or more overall points higher than the team rating, in which case you must still accept if the offer is at least 160% of the player's value. Same exceptions as in number 2. However, if you have already sold a starter this window, you can counter offer with an additional 15%. You are also allowed one reject per month of the window, to use at your discretion. [*] You can reject to sell club legends or long-time players (5+ years) as long as they are within 5 points of your team's overall rating. The only exceptions are if the players are either asking to leave, or 3+ points higher than the team rating. [*] You cannot sell more than 3 players from your main squad during the summer, and maximum 1 in January, unless a player demands to leave after you have reached this limit. [*] You can loan out any number of players if they are 10 points or below that of your team rating. Only 3 players above this threshold can be loaned out during a season, unless you need to lessen the economic burden of their wages. Football was introduced to San Sebastián in the early 1900s by students and workers returning from Britain. In 1904, they formed the San Sebastian Recreation Club and in 1905 the club competed in the Copa del Rey. In May 1905, the San Sebastian Football Club was formed as a separate branch of the club. In 1909, it applied to enter the Copa del Rey but complications over registration permits saw them compete as Club Ciclista de San Sebastián. This team defeated Club Español de Madrid 3–1 in the final. Out of the confusion, the Sociedad de Futbol was formed on 7 September 1909. 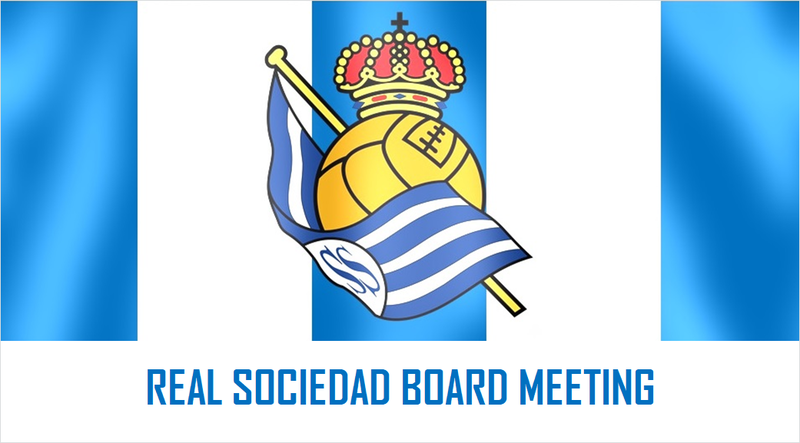 In 1910, King Alfonso XIII – who used San Sebastián as his summer capital – gave the club his patronage, where it subsequently became known as Real Sociedad de Fútbol. Real Sociedad were founder members of La Liga in 1929. The team came fourth with Francisco "Paco" Bienzobas finishing as top scorer. The team's name was changed to Donostia Club de Futbol in 1931 with the advent of the Second Spanish Republic, but changed back to Real Sociedad after the Spanish Civil War in 1939. The team has generally fluctuated between the Primera and Segunda divisions, in one period (during the 1940s) managing to be relegated and promoted seven times. From 1949 and 1962, the team found stability in Primera División, being a mid-table team. This positive run saw an end with the team being relegated to Segunda División in 1962, where they team had to stay for 5 seasons. In 1967, Real Sociedad went back to Primera División and started their longest period in this cathegory and played for the first time in European competitions in 1974. Real Sociedad won its first ever Primera División title at the end of the 1980–81 season, denying Real Madrid a fourth-consecutive title because although both clubs earned 45 points and Madrid had the superior goal difference Sociedad were better in the head-to-heads. The club retained the Liga title the following season, beating Barcelona by 47 points to 45, the second title under the management of Alberto Ormaetxea. Forward Jesús María Satrústegui was the club's top scorer for 1980–81 with 16 goals. The only sad news were the early elimination in the European Cup, defeated by CSKA Sofia. The club reached the semi-finals of the 1982–83 European Cup, defeating Víkingur of Iceland, Celtic and Sporting Clube de Portugal before losing 3–2 on aggregate to eventual champions Hamburger SV. Real Sociedad won the Supercopa de España at the beginning of the 1982–83 season, overturning a 1–0 defeat in the first leg to defeat Real Madrid 4–1 on aggregate. On 27 June 1987, under the management of John B. Toshack, Real Sociedad won their second Copa del Rey title, 78 years after the first, defeating Atlético Madrid 4–2 on penalties after drawing 2–2. In the 1987-88 season, Real Sociedad were runners-up for the first time since its lost its title and lost the Copa del Rey final against Barcelona at the Bernabéu. For many years, Real Sociedad followed the practice of its Basque rivals Athletic Bilbao of signing only Basque players. However, as a consequence of the departure of several important players (Bakero, Txiki Begiristain and López Rekarte signed by Barcelona), it abandoned the policy in 1989 when it signed Irish international John Aldridge from Liverpool. 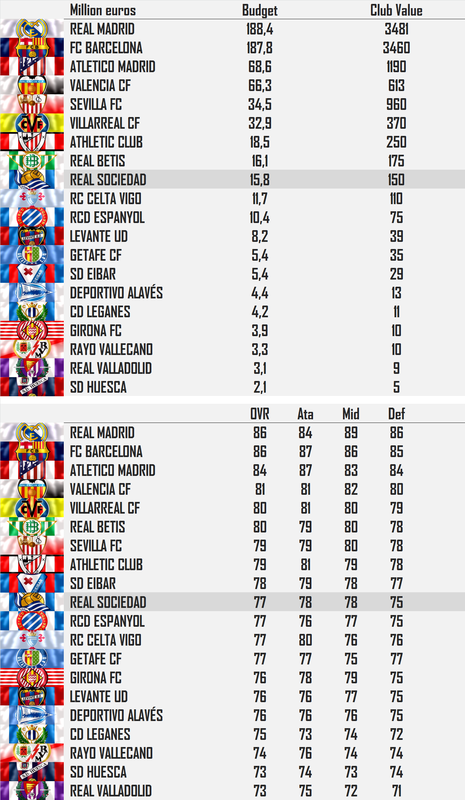 In the 90s, Real Sociedad couldn’t reach the level shown in the previous decade, although Real Sociedad finished third in 1998. In the 2002-2003 season, managed by the French Raynald Denoueix, after leading the league table for weeks, in the last weeks the team collapsed and gave away the leadership in the 37th week. The title went for the “Galácticos” Real Madrid. In this great season, La Real’s strikeforce combined the Turkish Nihat Kahveci and the Serbian Darko Kovacevic, a team that also included the Dutch Sander Westerveld and a young and promising Xabi Alonso. Despite the great season, after 40 years in a row in the top tier of the Spanish football, the departure of stars and great economic debts take the team to Segunda División only 4 years later. After 3 years in Segunda Divisón, the club returned to Primera División in 2010. 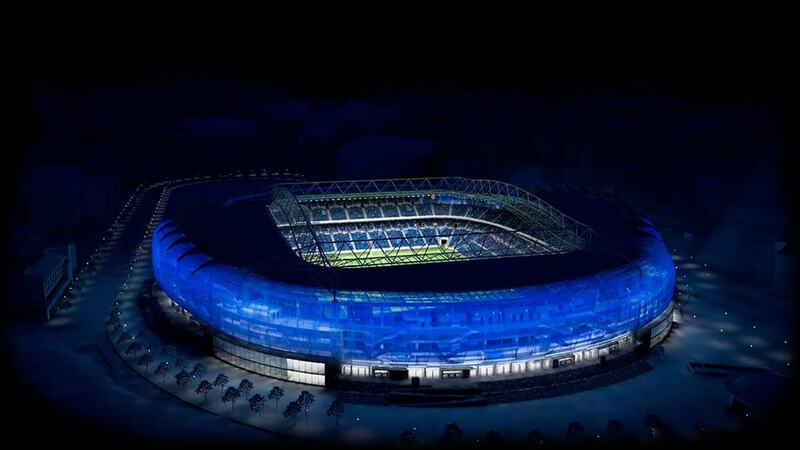 It plays its home matches at the Anoeta Stadium (32,076 seats) and have 23,103 ticket holders. Nowadays, the Anoeta Stadium is about to finish its renewal to make the athletics track disappear and get the stands close to the ground and the capacity will be increased up to 38,000 seats. The Basque derby is played against rivals Athletic Bilbao. Thank you!! I wish you like it too. A war of words starting already. No doubt the fans will be looking forward to the first derby to release all the tension and hard feelings. 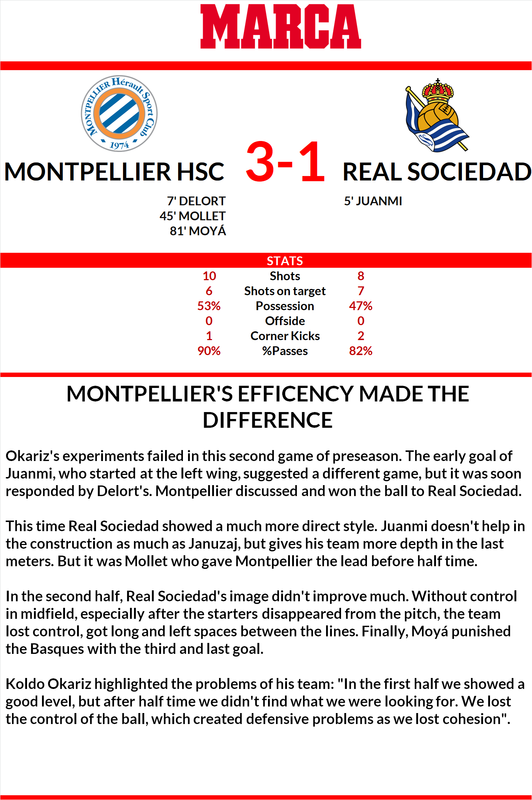 Nice, the Basque rivalry served hot; would be nice if Osasuna (Pamplona) can get in the mix of this too. I've always liked Real Sociedad and the city of San Sebastián-Donostia. Considering the situation of the club, I found challenging to do a career mode with them. A club with an important history in the Spanish football, with great achievements in the 80s and one of the best academies of the Spanish football. 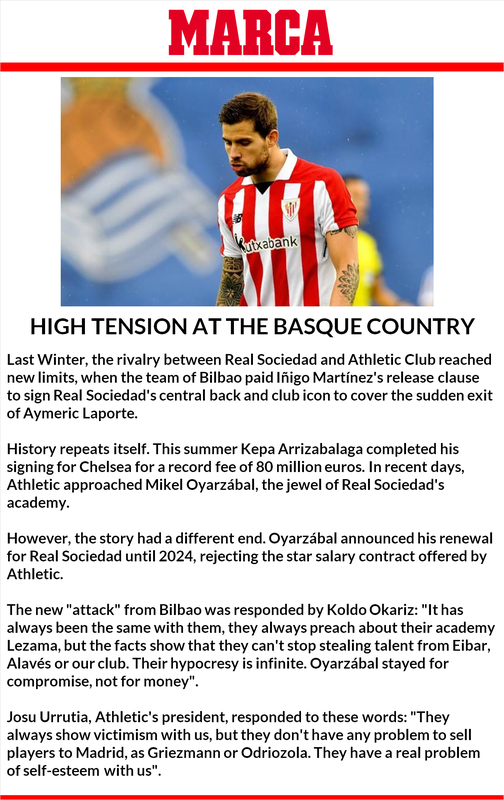 I wanted to highlight the rivalry with Athletic Club, because it sparked last year with the Iñigo Martínez case. 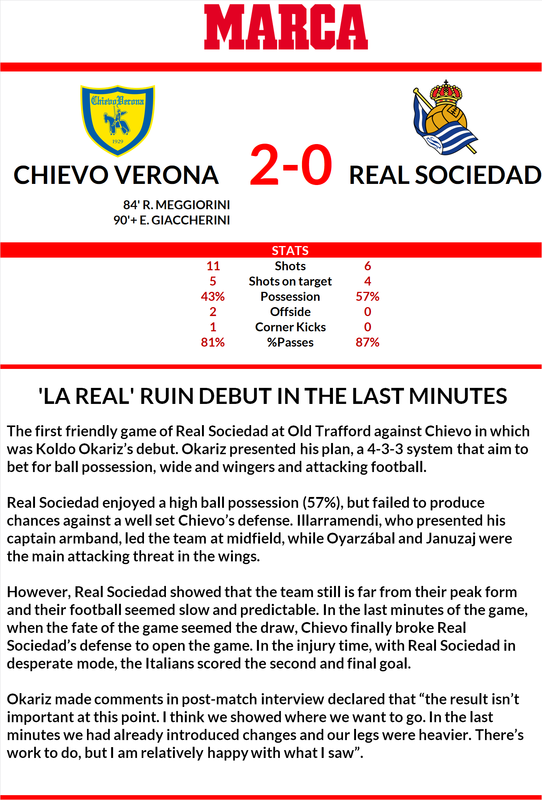 This is not the only time that has happened, as they did similar "attacks" on Real Sociedad with other important players of La Real (Loren in the 80s, Etxeberría in the 90s... recently Oyarzábal, there are more cases). Athletic Club always preach about being a "team of 11 peasants" and Lezama (their Academy). They say that they are a team of homegrown players, with players of the province of Biscay. But the reality is that they are always signing players from Real Sociedad, Osasuna, Alavés, Eibar, etc. Not so long ago, they didn't even play with a single player from Biscay nor grown at Lezama, but with players raised in other academies. Real Sociedad used to have a policy of homegrown players too, but in the late 80s they ended up signing players from other clubs too, because they couldn't keep their home talent. However, they still have lots of local players, which is to admire. @Danimal5981 Sure, not only allowed, I am willing to see your additions! @Danimal5981 @Stlducks @ASdoZeR @JoshDFC @WestardLord @Wyojasond , as usuals... and anyone who wants to interact in this story. As I did in last season's story, I wish you get involved in the decisions of the club and have your say. I want you to be Board members and have your say in the decisions of the club. You can even request to fire the manager at some point... or offer a renewal. In this Board meeting, you're going to set the objectives for this season. 2- No signings in the first transfer window. We're playing with the official squad until next window. 3- Finances: The club is the 8th in terms of transfer budget, with 15 million euros to spend. Currently, we also spend 579,300 euros/week in salaries. This is 30 million euros/year and the (real) budget of the club is 85 million euros. The club currently is in a healthy situation. Negative note: The team is out of European competitions, so we can't count on extra income. 4 - Sport situation: In terms of level, pundits say we're a mid-table team, with some chances to play in Europe, although there are superior teams in LaLiga. Note: FIFA19 state that our objectives are to be a mid-table team and reach the Round of 32 in LaCopa. 1) Finances: We have 15 million euros to spend. From these, 4 million have been reserved to sign scouts for the Academy. Our initial budget is 11 million. Which should be the final budget? b) More - We need to save costs for the future. State the final amount. c) Less - We must invest in the team to fight for European spots. State the final amount. Please, considering the previous information, what do you consider it would be the objective of the team? I'm very exited to have Koldo on board. The manager is with us at least 2 years. I want this club to grow to become the threat from the north. Obviously Real, Atlético and Barça are out of our league, but we should be able to compete for a Europa League-spot together with the likes of Sevilla, Valencia, Villarreal, Celta and maybe Betis. However, finishing in the top half of the table is good enough for now. A good cup run might be the quickest way to European Football, so I expect the manager to treat that tournament seriously. 1) Not sure if my other board members will agree but I’d like to only have one youth scout that scouts only Spain. 2) given the state of the team I think a top 10 finish and run in the cup is the best outcome. I’d also like to see us scout some defensive targets for the future. I’d prefer not to spend money in January but if the team is truly struggling then I say we may need to commit some cash. I very much agree with @Danimal5981 and think this is a time to be brave and aggressive. We can be in that second tier of the league right behind Barca and the Madrid clubs. Fighting for a European spot should be our goal. Winning the cup would be nice but not at the risk of dropping league points. I think we should scout Spain, try finding a few good youth talents for the future. We should also spend at least 9 million on the current squad. That means extending contracts and signing players ready to play in the first team. We should review Koldo's performance after two seasons to determine if he should stay or go. Amazing so far. Wonderful graphics and nice to have the readers get involved. Haven’t read your earlier stories so very excited about this one! 1. We do have a good squad atm. Our attack and midfield is young and hungry. I would like to see one or two defensive talents coming in as two of our CB's are reaching their 30s now and we need to be prepared for injuries etc. So invest some of the €11M to bring in some prospective players and keep some money in the back hand for new contracts. If we come out with €2M left in the end I would be happy. 2. A Top-10 finish and a nice cup run seem reachable at this stage. As said we do have some young players in the squad and this is the first season of Koldo to get used to everybody and everything. Thanks a lot for your answers!!! I'll try to do a summary of conclussions. Not the scores you are hoping for but it is only preseason so now is the time to try new things. Your shots on target percentage is very good so you must be creating some chances. Just need to be more clinical. Are you playing a flat 433 or attacking? Not the best start but at least gaining many insights. Seems like the team needs to work on their concentration as they conceded quite a lot goals within the last 10 minutes. But the chances seem to be there, they just need to be used. Not a great start with Koldo in charge, but maybe it's just growing pains. Might be a good idea to invest heavily in defense. We're testing things... The team have an attacking approach and the defensive balance is an issue. The attacking factor is a problem too... I always have problems to introduce the 9 into the game of the rest of the team. We'll work on this. Yes, defense need to be reinforce. Depth is the other big issue... in certain positions, there's too much difference between starters and subs. As I increased the injury sliders to 65%, we will probably have problems with it. I definitely hope to fix some errors before LaLiga starts. We don't have a terrible start (Villarreal, Leganés and Eibar), so I hope we can win points waiting for our best face.